The German Federal President, Frank-Walter Steinmeier, is currently very busy doing his constitutional duty. Before he is forced by the constitution to call a new election he is going around talking to the various party leaders trying to persuade them to form the Jamaica coalition. We can be pretty sure that as President he will act in a punctiliously correct manner – that's what German Presidents do – but we should keep an eye on the way this member of the socialist party, the SPD, who has served under Schröder and Merkel, someone with the socialist-establishment DNA, resolves the present political impasse in Germany. German Federal President, Frank-Walter Steinmeier. His resistance to holding a new election is interesting in this context. He magisterially asserts the principle that the parties have a duty to sort themselves out and form a workable government and that they should not attempt, through the medium of a second election, to dump that responsibility on voters, in effect, requiring voters to make a 'better' choice. The validity of Steinmeier's argument, worthy though it may appear, is not as sound as it may seem. The parties need to unite around the little bit of the political Venn diagram that contains the things upon which they can all agree, such as continuing to breathe and having breakfast in the mornings. There is little chance of success for anything more: the idea of CDU/CSU, FDP and Greens together in government is really a step too far towards diversity – it was bonkers when the Jamaica coalition was first mooted after the election and it is just as bonkers today. Nevertheless, Steinmeier is going round trying to get the Jamaica gang to smudge and fudge enough to avoid another election. Is this desperate desire to avoid a new election just a way of supporting his former boss Merkel and his longtime party, the SPD and of shoring up the status-quo? The constitution says nothing about the undesirability of new elections – that idea is Steinmeier's alone. We have to be clear how shapeless German perpetuity politics has become. Mrs Merkel, the CDU Chancellor, has let it be known that her preferred coalition would be just with the Greens. For anyone who has followed German politics for more than a decade that is the most astonishing thing for a leader of the CDU to say. The CSU, the default 'right-wing' party in Bavaria, the CDU's longtime partners (the CDU does not put up candidates in Bavaria) will do whatever is necessary to stick with Merkel and stay in government. During the sounding-out discussions, the CSU had agreed with nearly every policy the Greens had proposed, contradicting some of the key points of their election manifesto – in effect cheating the people who had voted for them, as the AfD pointed out. Fewer and fewer people vote for them and we see in this behaviour the reason why that is so. The question is: will Steinmeier talk to the AfD? The AfD is the third largest party in parliament. In a rational world there would be a coalition between CDU/CSU, AfD and FDP. It would be the only outcome that would invalidate our general principle: in German politics nothing ever changes. Such a coalition would be the political bomb that would bring astonishing policy changes: immigration, energy, regulation, EU, Euro - the list is very long and it would mean the end of fifty years of drift into the lumbering, soft-socialist politics of today's Germany. But our principle is safe for the moment. Steinmeier has not invited the AfD to talk to him and it will be a surprise if he does. He has no constitutional mandate to forge a coalition according to his own lights. He can only encourage the parties to produce a workable government under the leadership of the largest party, in this case the CDU/CSU. There is absolutely no point his talking to the AfD: all the other parties have ruled out a coalition involving them, the third largest party, a fact which in itself says a lot about the current bloated, anti-democratic consensus thinking in Germany, which leads to nearly 13% of Germans voting for a party that is then excluded from all participation in the government. As we have repeatedly pointed out, the German constitution inhibits radical change, but in doing this it has arrived at the point where one major party is shopping around for some combination of minor parties that will keep it in business. Weimar anyone? The German elite can then carry on ignoring the elephant in the room, the AfD. There is a similar reason for the establishment's revulsion at the thought of a minority government: not only is such instability deeply unteutonic – italianate almost – the same conflicting patchwork that Jamaica would have been will be even worse in parliament. It is difficult to see how any measure would ever attain approval. The only honest way out of this impasse is a new election that might just detonate the CDU/CSU-AfD-FDP bomb, thus resetting every political parameter of the last half century in Germany and in Europe. We would be very happy to have our principle falsified. By the way, the AfD speakers put on a sparkling performance at the opening of the German parliament yesterday. In Alice Weidel, their parliamentary leader, they seem to have got their own Nigel Farage, someone who can sock it to the establishment in five-minute video bouts. Unlike UKIP, they also have strength in depth, being able to field any number of good performers who are good speakers on top of their brief. Perhaps the AfD won't be able to be ignored for long. 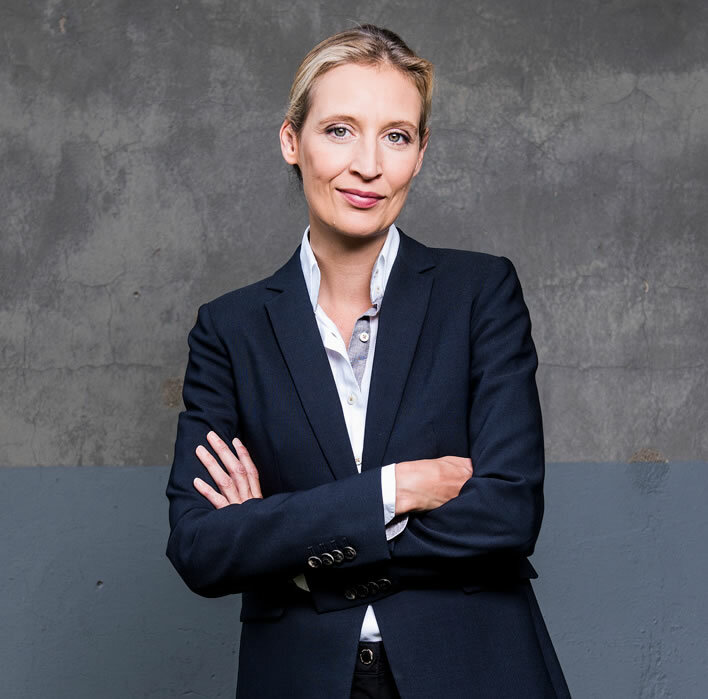 Dr Alice Weidel, Co-Vorsitzende der AfD-Bundestagsfraktion. A piece in the Neue Zürcher Zeitung today extends our analysis of the role of President Steinmeier and pushes it in an interesting direction, one which I wish I had thought of myself. It's seems obvious: Steinmeier is not trying to stitch together the doomed Jamaica coalition but is trying to persuade the SPD to go back into a 'grand coalition' with the CDU/CSU. This solution would keep Merkel and the CDU/CSU in power, keep the SPD close to power and Merkel could swat away the smaller parties with contempt. Oh, and of course, it would have that most wonderful property of all in German politics: nothing at all would change from the last time round – an election was held, there were alarms and excursions onstage and off, but ultimately the government remains the same. If anyone can achieve this, then Steinmeier can. As the NZZ correspondent, Marc Felix Serrao, points out, Steinmeier is as close to the beating heart of the SPD as anyone. He not only knows everyone who is anyone but he has worked with them all in some role or other over the last forty years and himself has held high office for twenty of those years. He is greatly respected by all the great and the good in the party. In comparison, Martin Schulz, the party's current leader, is a stripling teaboy. 'Until February Schulz was in the European Parliament and thus lightyears away from Berlin politics', as Serrao puts it. Schulz it was who chose to renounce a further coalition after the election. If anyone can get that decision reversed, then it is Steinmeier. What the electorate will think of this no one knows. In another four years who knows for whom the sheep will vote – but then, who cares? Nothing will change. 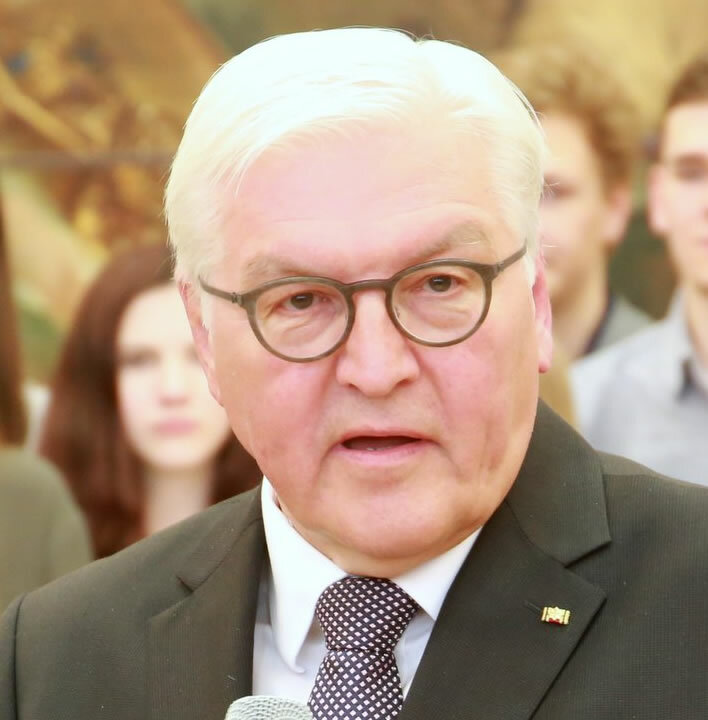 If Steinmeier's machinations succeed then we on this blog will be very happy, since our motto has once again proved itself even in these stormy times: in German politics, nothing ever changes. More evidence for the sheer intractability of building a Jamaica coalition for the federal government comes in an interesting interview with one of the participants, Wolfgang Kubicki, Deputy Chairman of the FDP. 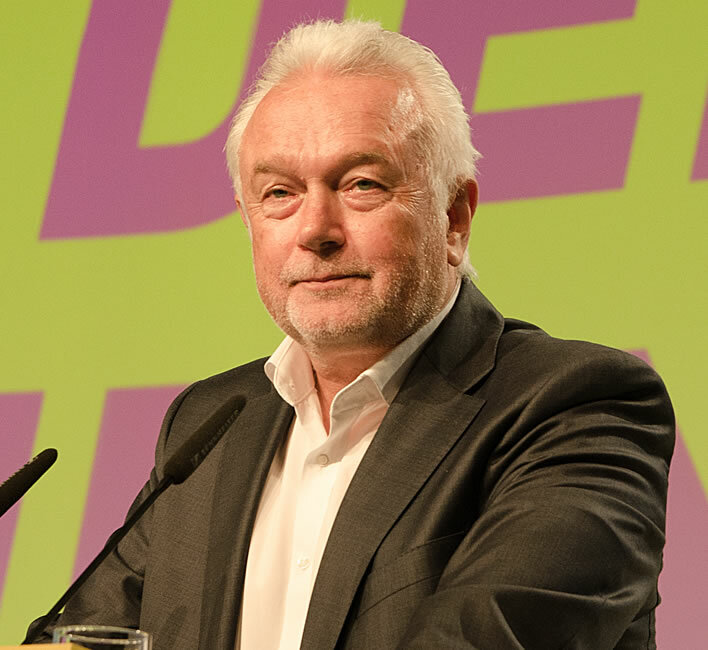 Wolfgang Kubicki, Deputy Chairman of the FDP at the party conference in Berlin on 17 September 2017. Image: ©Caitlin Hardee, FDP. Even on Sunday, the last day of the sounding out process, we had 237 points of dissent, around 80 of them relevant ones. This was not just about finding formulations.